With the recent premier of The Help, a movie set and mostly filmed in Jackson, I thought it might be timely to start a series about Jackson’s forgotten cinema connections. 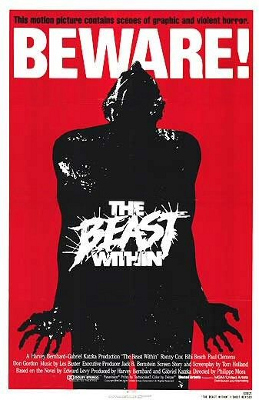 Almost thirty years ago, Jackson was the location of the filming of The Beast Within, a gory thriller set in the backwoods of the deep south. An adaptation of the bestselling novel by Edward Levy, the movie was released in 1982 to dismal reviews. Critics said it was “cheap and exploitive”, which is still true today. Somehow it managed to gross over $7,000,000 at the box office, which is not too shabby for being up against E.T. Today the film enjoys a resurgence in indie horror circles, where bad films are celebrated. The premise of the movie is this: A young couple in on their honeymoon in the fictional Nioba, Mississippi. After some night-time car trouble they are separated, and the woman is attacked and taken advantage of by some sort of locust creature. Fast forward 17 years: The couple has raised a healthy teenage son, but he’s starting to undergo some very strange changes. Suspecting the events of the past, they travel back to Nioba to investigate. Here the boy finishes his gruesome transformation into a cicada monster in order to continue the cycle. But can he be stopped? The movie may be obscure, but check out this star-studded cast: Ronny Cox (banjo player #2 from Deliverance), R.G. Armstrong (the general from Predator), Boyce Holleman (MS state senator turned actor) and leading lady Bibi Besch (Captain Kirk’s mom in Wrath of Khan). Look out Emma Stone! I can only imagine the paparazzi circus that must have been here. Is it worth putting this movie on your netflix cue? Tough call. For me it’s greatest highlights are the clearly recognizable scenes around Jackson, particularly the swamps of Lefluer’s Bluffs State Park and the old train tressel (see Belhaven’s Hidden Trail). The downside is that it’s 98 minutes of your life you can never get back. I suppose the film is unique in that it is based on the reproductive cycle of the cicada. It’s also the only movie I know of set in Mississippi that doesn’t depend on racial tension, though there is a slightly offensive “drunken Indian” character. Perhaps the trailer can help you decide. The film seems to be marketed and written around the 10 minute gruesome effects sequence of the boy turning into a cicada. In an effort to preserve the dignity jackson obscura has after this post, I’m not going to link to it, but with a little searching you can watch it for yourself. It’s pretty remarkable for 1982. It’s still gross in 2011. I’d probably go see The Help instead. Ronny Cox is not the banjo player from Deliverance, he’s the one who does the little duo with the banjo player. Ronny Cox has been in several movies, including Beverly Hills cop.